Right now I’m all about 2 things. Using the mitre saw Rob bought. In order to both use the saw and feather our new-ish nest I’ve been drawing up ideas to make things pretty and functional. You see our house is pretty crap about storage. Sure we have a pantry but that’s because we only have, like, 3 kitchen cabinets. Okay, so I’m exaggerating a bit. We have 5. <— not exactly exaggerating. And we have 3 closets in the spare rooms/offices but they are all full of Rob’s art. So I’m trying to find ways to hide things in plain sight. 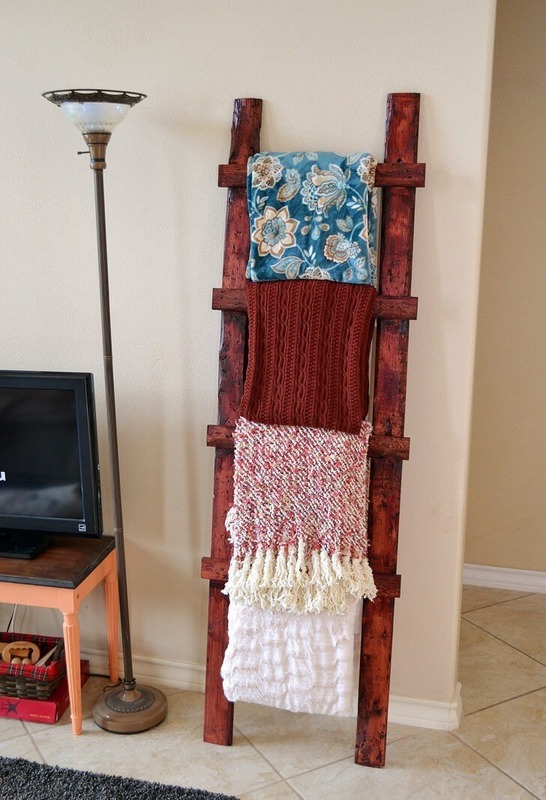 So when we saw a ladder at the store that looked rustic and awesome and would be the greatest place to hang up our living room throw blankets we ran over and flipped over the tag. Or maybe I ran over and Rob eventually got to the ladder, too :) Once that tag flipped over I immediately started cursing. Because it was a flippin’ ridiculous price. 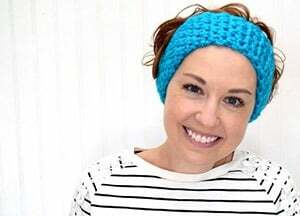 I know it’s one of those places that does “sales” so you can wait and get it on discount and feel good about it, but 50% off of ridiculous is still dang ridiculous. I was all, screw that ladder! 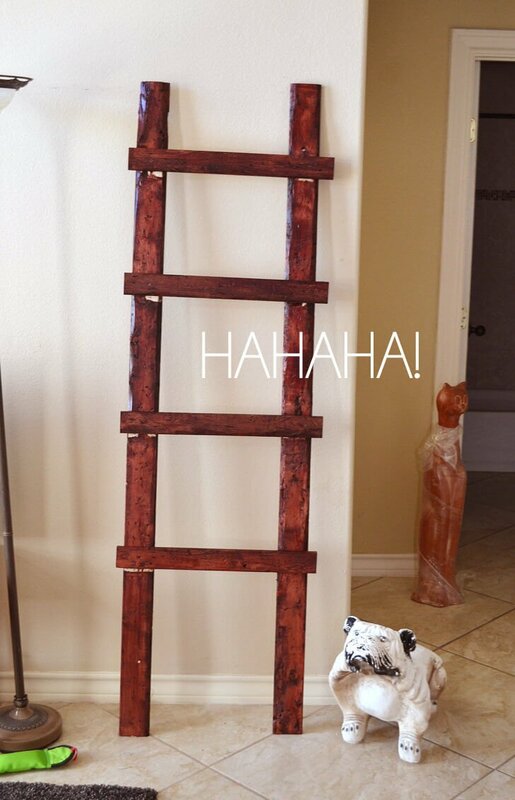 I can make my own friggin’ ladder! And so I did :) Now it didn’t come together perfectly because I’m still new at this stuff but it did come together and really dang well in the end. And since I keep it real ’round here I also shared my significant fails down below. 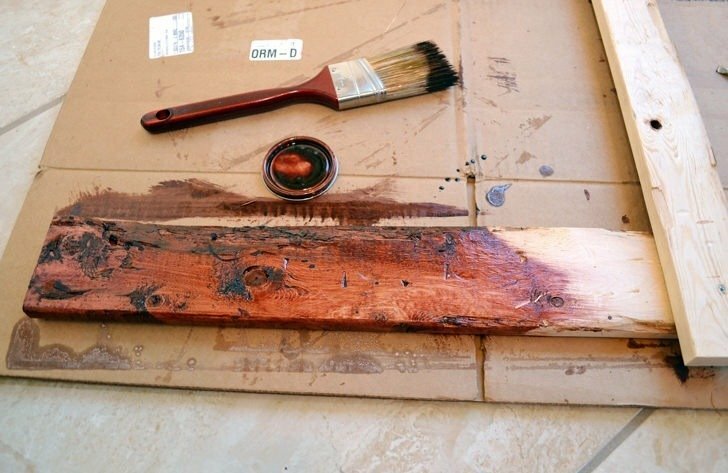 So if this is your very first wood project know a few things… The wood will cost you around $8 so even if things go way wonky you won’t have wasted tons of money. 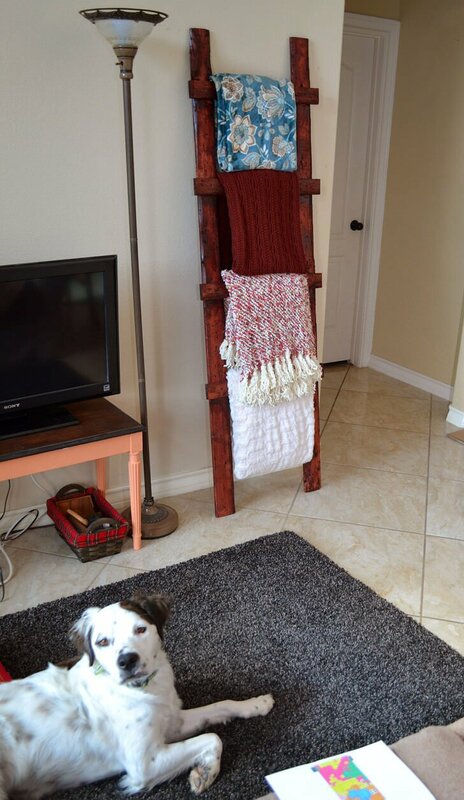 There are far more expensive crafts out there to mess up but this ain’t one of them. You can finagle this thing a good couple of times until you get it right so if you don’t succeed the first go have another 2 of 20 if you need it. You don’t need any super fancy tools. Yeah, we have this fancy mitre saw but I bought this wood way before we had that in our garage. My plan was to use my old school mitre box and saw like I’ve done for every other project on this post and it’s not a far-fetched idea because you don’t have a bazillion cuts. So let’s get this thing together, shall we? I purchased 2, 8-foot 1×4 boards and 1, 8-foot 1×3 board of furring strips. They are the cheap stuff :) I went through and picked out boards that were straight but flawed. Ones with bark still showing were what I specifically wanted and they were easy to find. Each board had some printing on it so I simply sanded that off with a quick hit with sandpaper before moving on. 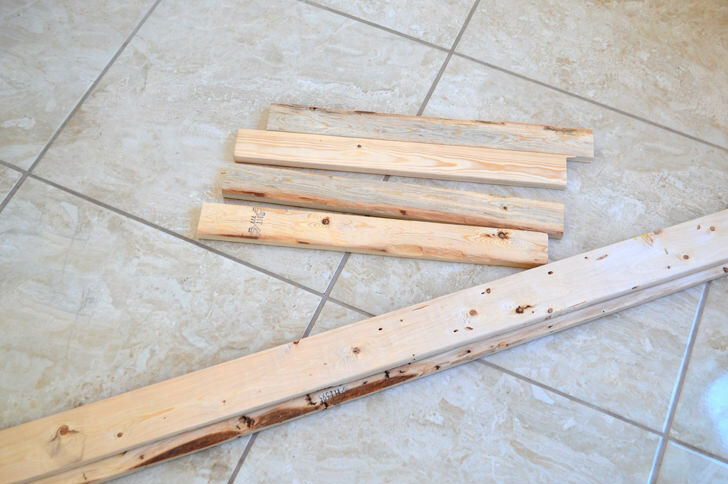 Rob cut my my 1×3 board into slats for the ladder at 22″ apiece. I was able to get 4 out of an 8-foot board with a bit of scrap wood left over. My 8′ boards were trimmed down 72″ each for each side of the ladder. 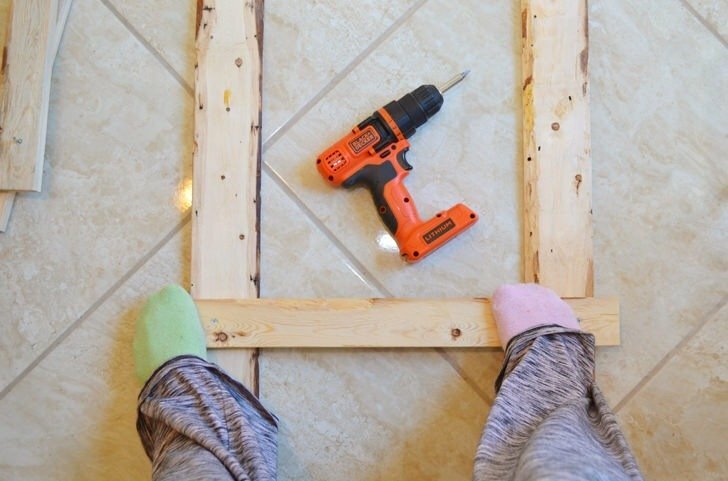 Lay the ladder’s legs on the ground equally distant from one another top and bottom bottom and place the bottom edges on something straight. 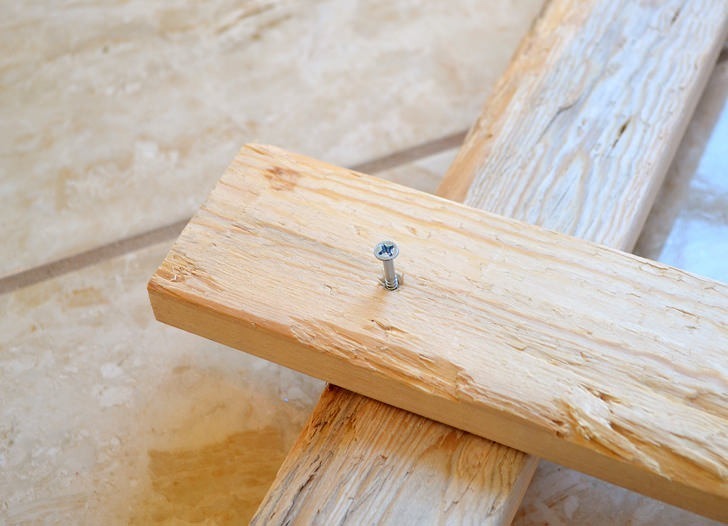 You can use just about any screws you have on hand just so long as they aren’t so long that they go all of the way through both pieces of wood. My screws were #6 1 1/4 wood screws I already had on hand but you can grab a back for around a buck-ish. Now, you can tell that this is totally out of order, here but we’re going to go with it anyway. See that blue thing? 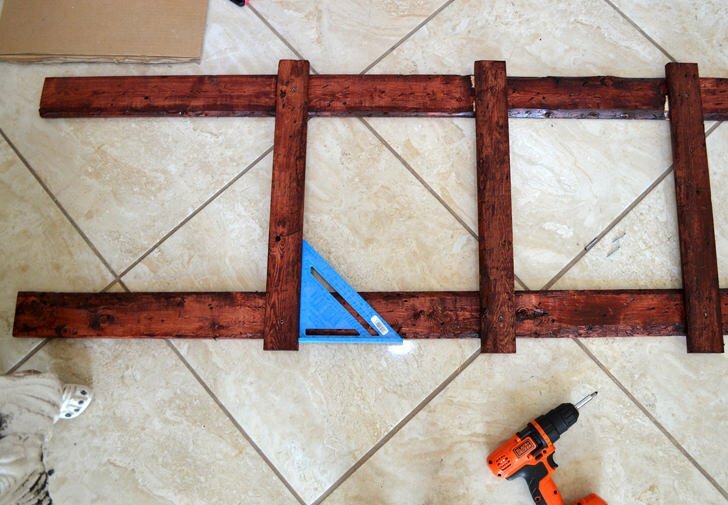 It’s a speed square and I should have busted it out long before the wood stain but I’m new to this stuff and didn’t think about it. If you make sure your legs are equally distant apart and straight you can use the speed square to line up each slat. Run the ledged bottom of the square along the edge of the leg and then make sure that the slat is flush with the 90° angle. 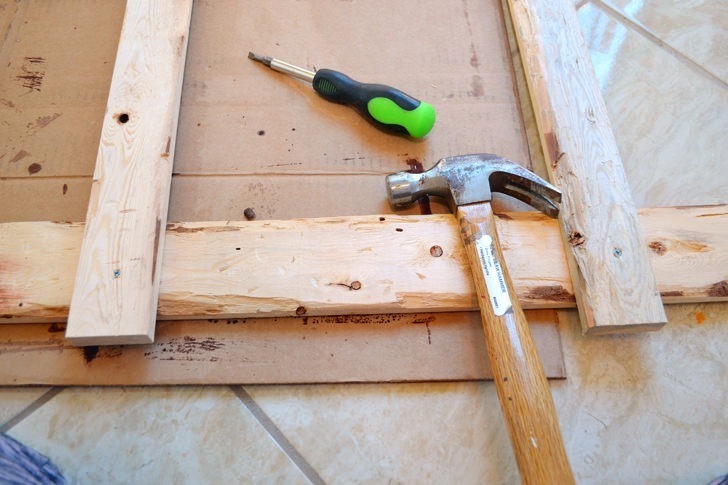 Repeat for both sides of the slat to double check and then screw down. You just need one screw per side… nothing fancy. I wound up figuring it out by placing the legs of the ladder pushed flush against that wall there so that they would both touch the floor the same. Then I measured out the top and the bottom with my tape measure to be SURE that they were both the same amount of distance apart. Not bad for $8 even if it took me way longer than I had anticipated to get it done! But it was a really good learning experience, too and I’m pretty confident that if I make another one, maybe for towels in the bathroom, that I will have no problems making it significantly less wonky on the first go of it! Just saw your post on $6 ladder. Love it. 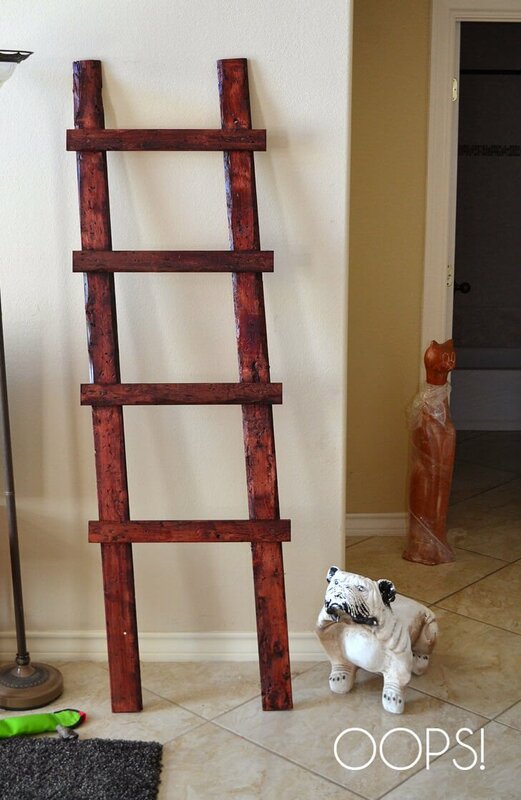 Saw a ladder at World Market for $60…NO WAY! You’ve inspired me to give this a try. I need this for towels in my bathroom. 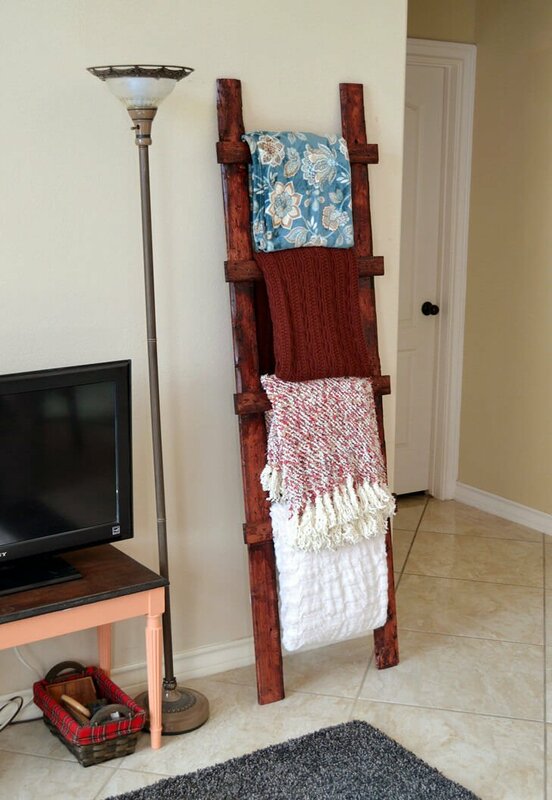 What keeps it from falling down when you either put a throw on it or take one off? You just steady it. We’ve used ours almost daily for years, now, and the only problem we have is sometimes the robot vacuum cleaner really smacks the thing but it rarely falls over even then.